This is not a review. This is just a quick intro to a light I just got that made me wonder if I have the tools, skills, and temperment to write reviews. So don’t expect much. I’m just goofing around. I ordered a Kaidomain KDIY K5s with a 3000K XHP50.2 for myself for Christmas and it arrived today (2 Feb). I’m a fan of the 1× 26650 format. They don’t fit in my pockets, but I still like them, and want to buy more. The K5s is pretty consistently between the BD06 and the BD01 (larger than the BD06, but smaller than the BD01). Size is where the similarities end. The Convoys both have a side switch for power and modes. the K5s has a tail switch. Both of my convoys have an XML2 U2 T6 4C 4300K-4500K emitter. I chose the 3000K version of the K5s with its XHP50.2. That’s a huge difference, but more on that later. Here’s a quick teardown of the lovely K5s with its factory foybezel. There are lots of nice red accents on this light. Unfortunately, only the O-ring behind the AR glass is visible when the light is fully assembled. Lots of people here are familiar with the KD drivers, so I’ll just say the strobe mode is hidden, and it has mode memory, so I like it. The beamshots were not taken in full manual mode. The white balance was set to 4000k for all of them, so you can get an idea of the relative tint, and beam shape/size, but not the brightness. And that brings me to the real reason I bought this light. The XHP50.2 is supposed to be bright. The Kaidomain page says 2650 Lumens, but as others on BLF have pointed out, that’s probably at the LED, not out the front. But it is really bright, and being a 50.2 it has a nice beam. I don’t have an integrating sphere, but my beamshots were ceiling bounces with a purpose. The K5s light up the room noticeably more than either of the Convoys. So far, I really like this flashlight. It’s bright. I suspect the BD01 could throw farther, but the lumen difference is easy to see, even though the tint of my K5s is much warmer. The only minor nit I could pick so far with the K5s is that its switch is loud. There’s probably no real problem with that, but it just sounds kinda cheap. I want to test Kaidomain’s claims of runtime. That’s another reason I love 26650s. Even 60 minutes on high or 4-5 hours on medium would be awesome for a light with this much output. I’ll be interested to see how all those deep fins dissipate what will have to be a significant amount of heat. But that’s a bit much for delivery day. Here’s a link to all the photos full size if you want more detail. Edit: Updated link to KD’s new web site. Ever play with the Ultrafire F13? It’s usually loaded with a cheap LED and crap driver, but it makes an awesome host. 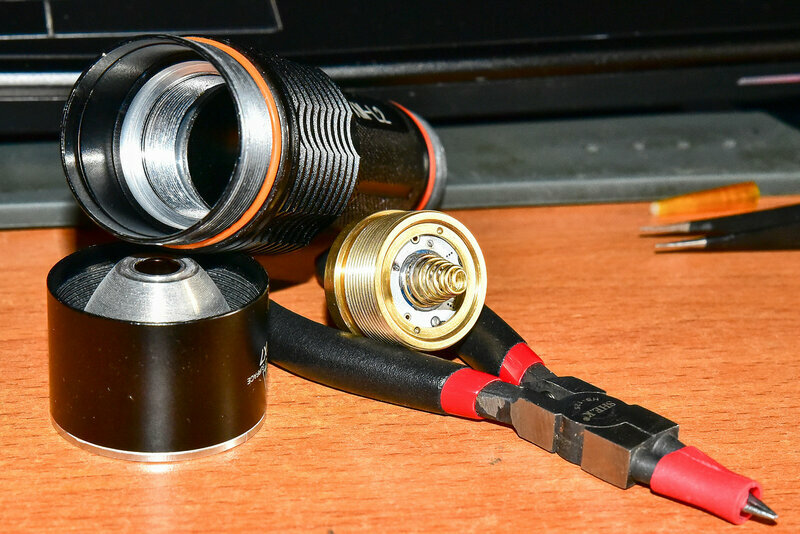 22mm driver, 20mm LED star. I’ve seen it modded to take XHPs, triples, you name it. I choose this switch because of this can handle CREE XHP50.2 LED at high mode. Please don’t be worried. The quality is good. 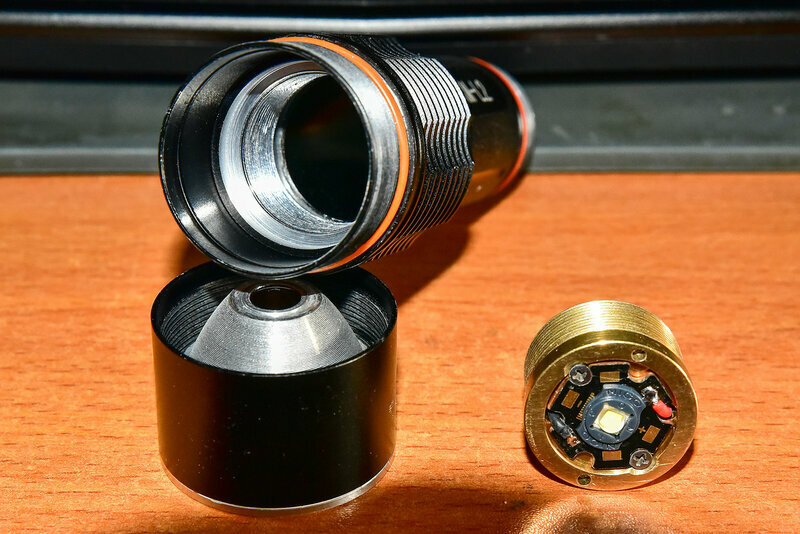 We will not choose to use any cheap components to build the flashlight. I will pay more attention on that. I’ve seen it, but the fasttech description never mentions that it takes a 26650. Looks pretty familiar. I might get an F13 just to have a AAA emergency backup, since the K5s didn’t include that carrier. Still for $33 with a constant current (no PWM) driver and an XHP50.2, I would have a hard time saving any money building my own from an F13. Good to know, and thanks for your response. I took this light outside last night, and I’m thoroughly impressed with it. The switch noise probably only bothered me because everything else about this light feels and looks high quality, so the loud clackity switch seemed anomalous. But knowing that it’s a good quality component, I’m sure it won’t bother me any more. Great light, at a great price. Thanks! After a day or so with the K5s, my wish list of Kaidomain lights is growing. We must continue to keep improving on our products. I like the clean SS bezel. Good review. I just put in a order for a Kaidomain KF8. I was looking at the K5s and that will be my next light. There should be an option for a bezel the same color as the rest of the body. Thanks. I hope to do some real outdoor beamshots soon, but given my current health, I’m not making any promises. I really like the SS bezel, also. It’s very nice looking. This was my first Kaidomain flashlight, and I’m having to force myself to stick to the budget before ordering more. The K6 looks like a poor man’s GT. That’s pretty high on my list. Thanks for posting manithree, I think you’ll do good on reviesw! I never paid attention to the K5S until now, great warm tint XHP50.2 and a great price! Would be even nicer if the tube had knurling. I and I’m sure some others would like to see this same light internally but in a Ultrafire F13 body or in a Convoy BD06 body but with tail switch only. I would pick up at least a couple. Made by Kaidomain. The K5s is not appealing to the eye at all. A complete flat black option version for the K5s would make me buy one for sure. I ordered your E6, KF8 and aTrustfire A8 and look forward to them. Thanks for the great products. Even though I usually prefer SS bezels, I think that’s what I like a lot about the Manta Ray C8.2, that’s similar to this, it appears a more “matte” black anodizing than most, just wish it had the NW option. Clicked on the link in the OP, and it’s 404. KD ain’t selling them anymore? My only “complaint” is that the top 3 modes seem bunched-up at the top. From 5% to 35% is a huge jump, and from there to 65% then 100% is hardly any visual difference in brightness. I have lights like that, and they’re great for when you want lots of output (those rare times I use them, I usually just keep them stuck on 100% and forget about it), but they’re lacking that versatility of having evenly-spaced modes. Maybe 5/12/30/100 would be better? Would the drivers be reprogrammable, by any chance? Other than that, it looks really solid, and I’d love to get one… or two. KD’s website underwent an overhaul since I originally posted, so my link died due to bitrot. Fixed now, thanks to BanL. Mmmm, only if it’s done right, otherwise it’s just an endless annoyance. Too few lights get it right, unfortunately. I’m tempted to get one as-is, but I get the feeling it’d be Yet Another Light I Keep Stuck On 100% And Don’t Change. Even my F13, I made a 1-trick pony with literally a 1-mode driver. And so, it usually just reigns over the shelf. TK18, SP32A. *, Q8, C8F… all hella-bright lights that kinda obviated the “need” for the ’13. Hope you like yours as much as I like mine. I’m partial to high CRI emitters, but this warm xhp50.2 is pretty nice, too. I just got back from a week at the cabin (camping, essentially), and this light was pretty popular. It’s just a good all-around mix of flood and throw, and the whole family liked the tint. This and my Sofirn C8F were popular for seeing deer retinas at night, but the Convoy L2 beat them both. But not by a whole lot. Anyone know if that tactical ring thingy comes off of the KF8? Also is there a momentary feature in the tail clicky? This light get hot quick at full power tho should i be worried? It gets hot enough to be painful, that’s for sure. It’s not a light to hand to a small child, and arguably not a light for someone who isn’t at least somewhat of a flashlight enthusiast and careful. That depends, do you like your tools sharp, effective, and potentially dangerous if misused? I don’t know if this light has the fire-starting capabilities of, say, a D4, but it’s not a toy. I’m liking the XHP70.2 version. The finish is better also. Yeah, I would trade my Thorfire S70 for one of those.